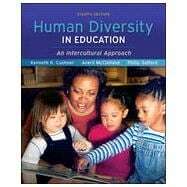 This eighth edition of Human Diversity in Education: An Intercultural Approach continues to focus on the preparation of teachers and other human-service providers who not only can teach and interact more effectively with the wide diversity of students they are certain to encounter, but are also able to transmit this knowledge and skill to the individuals in their charge. The book continues to provide a broad treatment of the various forms of diversity common in today's schools, including nationality, ethnicity, race, religion, gender, social class, language acquisition and use, sexual orientation, health concerns, and disability. We also maintain its research-based approach, with an increased cross-cultural and intercultural emphasis. We continue to stress that it is both at the level of the individual teacher as well as the organizational structure of the school where significant change must occur with regard to how diversity is understood and accommodated.